Last week we reported that Nvidia is releasing two Star Wars-themed editions of its powerful Titan Xp graphics cards, and we've just been sent the Galactic Empire version of the card. It's an absolutely stunning spin on the Titan Xp, with some lovely little touches and details that will make any Star Wars fan as happy as Chewbacca on Life Day. Check out our unboxing video below to see the Nvidia Titan Xp Star Wars Collector's Edition in all its glory. 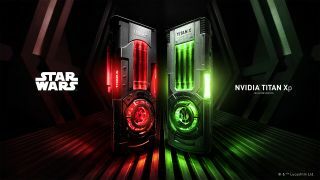 The new two new collector’s edition Titan Xp graphics cards have been crafted to reflect the look and feel of the Star Wars galaxy with Jedi Order and Galactic Empire versions. As we saw in the teaser, these cards sport a much more streamlined shroud than the prismatic design of the original card. Both versions feature much more lighting too, with illumination added to the heatsink and fan. It’s no coincidence these two Star Wars-themed GPUs look like lightsabers when seen from the side. The two cards have slightly different finishes with the Jedi version simulating the battle-worn finish of the Rebel Alliance. Nvidia says it subjected the die cast aluminum exterior of the card to an extensive, corrosive salt spray to achieve the look. Conversely, the Galactic Empire version is more refined with straight lines and a clean finish to emulate the orderly nature of the resource-rich organization. Looks aside, this is still the Titan Xp we’ve know and love. The Pascal-based GP102 GPU features all the same specs as the regular version with 3,840 CUDA cores running at 1.6GHz, and 12GB of GDDR5X memory running at 11.4Gbps. What’s most surprising is this special edition version won’t cost any more than the normal Titan Xp at $1,200 (£1,149, AU$1,950). Preorders on Nvidia site begin on November 8th.